Christmas time has many traditions for lots of different people. One tradition that I like is the Christmas tamale. Tamales traditionally are stuffed with chicken, pork, and beef. There are even sweet tamales made with cinnamon and raisins. Tamales can be stuffed with anything your imagination desires. How about bacon tamales? 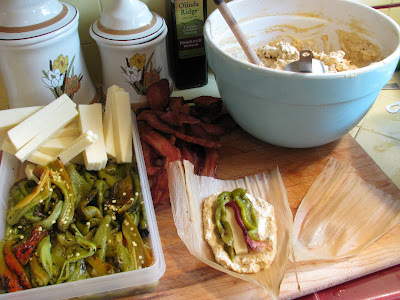 Oh yes, bacon, roasted peppers and jack cheese will fill these corn masa tubes of joy. The secret to good tamales is fresh masa. Masa is a corn based dough that is used to wrap the filling. Fresh masa can be purchased at Mexican specialty markets or you local tortilleria. Todays masa was purchased at 'La Finca' in Oakland California. We are using some peppers that we procurred last summer. They were fresh roasted and sealed away in the Chilebrown Icecave. The only trick to making tamales is to have all your ingredients ready and in place. Take your masa and add chipotle puree and bacon fat. Mix well. Take a corn hush and add 1/4 cup of masa and spread evenly into a square shape. Add a strip of cheese, pepper and bacon. Fold into cylinder and fold bottom end up. Place assembled tamales into a steamer and cook for aprox 40 minutes. When the dough is firm and the cheese is melted they are done. 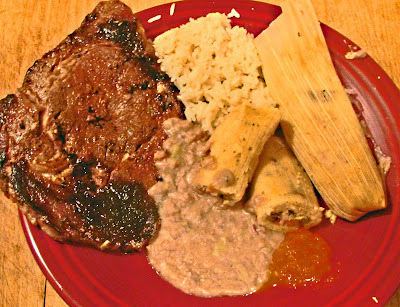 These tamales where served with some grilled steak, rice and some refried beans. 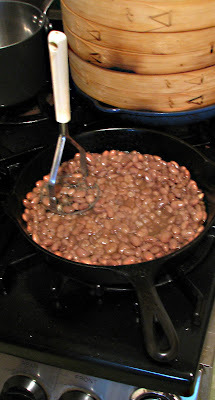 More bacon fat was added to the beans. Christmas time only comes around once a year so do not fret about the bacon love. This is one hearty meal. The tamales were so good that I went straight to the couch to celebrate. This is comfort food that puts a smile on my face. The green chile gave this tamale a little kick in the pants. Cheers! I have never eaten tamales - do you eat the corn husk, too, or is it just there to hold the other ingredients while steaming? Zoomie, You do not eat the husk.It is very tough and is only a vessel to hold the filling.It does give a flavor to the finished product. Peggy and I were in San Diego at a restaurant and a lady at the table next to us was trying to eat the husk. I politely told her that she needed to remove the husk. She was very embarassed. I did not laugh until later being the gentleman that I am. Green chile, cheese and BACON!!! I should make tamales but it is too easy to buy them from the Mexican ladies who crank out by the dozens and sell them for their church benefits. I have 3 dozen in my freezer right now. Greg, Do they make green chile, cheese and bacon? Wow. You make it sound almost easy. Well done, bacon dude. Well I just think this sounds delicious. Never made tamales, I really should give it a try. Cookiecrumb and Lea Ann, it is very easy to make. The recipe makes over 2 dozen. They freeze very well. I tried to eat a tamale husk only once. Chili-this is pretty amazing. I've never made tamales, but I know they are a heck of a lot of work. They look great, job well done. Andrew, Give it a try. Get the whole family involved. I know you will have some great meat fillings.